If you’re looking at or using WP Engine or Pagely, then you are serious about your website, and I congratulate you. When it comes down to it, WP Engine and Pagely are both top of their class in managed hosting, but when you pit WP Engine vs Pagely, WP Engine wins for 5/6 reasons. 1. WP Engine has more full-time WordPress experts on staff (per 1000 customers). WordPress is amazing, but for the best performance out of your WordPress installation, you need knowledgable WordPress experts. I have personally taken advantage of WP Engine’s support, and they are always quick and knowledgable. In reality, no web host can ever guarantee that your website will not get hacked, but WP Engine is the only web host which will un-hack you site for free! WHAT?!? Yes, if your WP Engine site gets hacked, then WP Engine will fix it for free. When you start to compare WP Engine vs Pagely when it comes to security, you can’t beat the fact that WP Engine backs their promise up by committing to un-hacking your website. 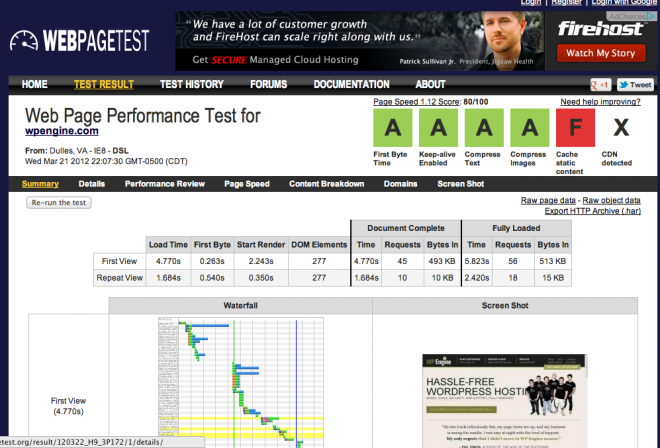 According to tools like Pingdom and WebPageTest.org, WP Engine serves sites faster than anyone else. 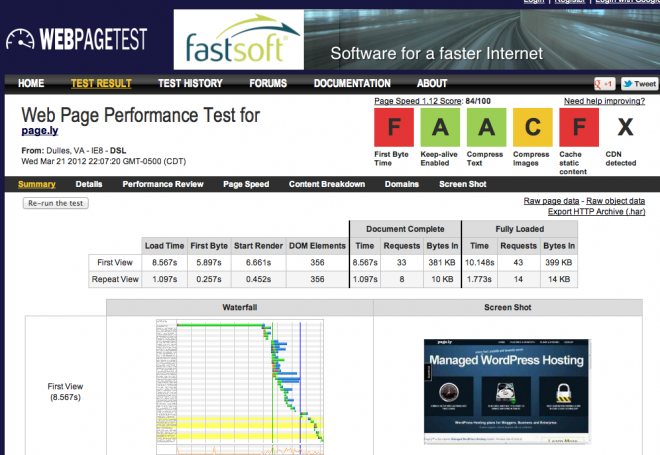 Just to test this out for myself, I went ahead and did a speed test at WebPageTest.org to compare WP Engine vs Pagely, and I was surprised by the results. Below are two screenshots the tests I performed. You can see the results for yourself. WP Engine wins when you compare WP Engine vs Pagely. WP Engine’s own website has several comments made by customer that attest to the speed of their website on WP Engine compared to their previous host. So, if speed is a priority to you, then WP Engine wins when you compare WP Engine vs Pagely. As a disclaimer, this does not mean that Automattic prefers WordPress as a web host. But, when Automattic, the company behind WordPress makes an investment in a hosting company, you know they’ve got to be doing something right. This shows that Automattic likes what WP Engine is doing, how they’re doing it, and that they are committed to WP Engine’s success. When you compare WP Engine vs Pagely, Automattic’s investment in WP Engine should be a no-brainer when it comes to picking the best option for you high performance website! *Update* – WP Engine has since updated their pricing such that a CDN is $19.95 extra for the personal plan. WP Engine also allows 25,000 unique visitors per month now, as opposed to 50,000 page views per month. Neither managed WordPress hosting providers provides a CDN with their entry level plan. It’s a draw. WP Engine charges $29.95 for 25,000 visitors per month, and Pagely charges $24.95 for about 25,000 visitors per month (as estimated on their site). Let’s just call it even and say they are about the same price. WP Engine is giving you a CDN with the price of your web hosting for about the same price that you are getting just the web hosting at Pagely. Again, when you compare WP Engine vs Pagely, WP Engine wins. I’m sure you’ve heard all of the buzz about CDN’s over the past year or so, and I’m sure you know at least something about what a CDN is and why it is important. Just to make sure though, there are at least two reasons why a CDN is important to your website: it offloads processing from your server and it will serve content faster to your audience by serving content from servers closest to a visitor. You can always purchase your own CDN and hook it up with your WordPress install, but WP Engine provides a CDN and they take care of all of the work. Again, when you compare WP Engine vs Pagely, WP Engine wins. As you can see above, WP Engine wins hand down when you compare WP Engine vs Pagely. If you are serious about your WordPress website, then we can not recommend a better web host than WP Engine. WP Engine wins vs Pagely, and we are sure that you will be delighted with your supercharged WordPress service! Hi, this was a helpful read to compare the two services. I’ve just moved to Page.ly because as you say I was serious about proper hosting for WordPress. The reason I went for page.ly was because I just couldn’t stretch to the WPEngine cost for a first time on a managed WordPress service as you get a good discount on second sites hosted with Page.ly. It’s also worth noting that Page.ly don’t offer email but the other reason I chose them was they do offer a UK server and as far as I understand are the only managed WordPress service to do this which made sense for me as the site was serving UK customers. There are also beginning to be other managed WordPress providers such as ChurchPr.es which are worth noting. My WordPress Powered Site with zippykid had some support issues. So, I checked some other options such as WPOven, Page.ly, Synthesis, WPEngine. Page.ly donot give Site migration in their basic plan. WPEngine, WPOven and Synthesis gives Site migration assistance. WPOven has some very good features. Synthesis is the cheapest. But i Switched my site over to WPEngine as it is the most popular and therefore looks very tested solution. But it charged fee for site migration. Interesting review. We’re on WP Engine currently, just came to the end of a year. Been noticing lots of people, Chris Lema et al, moving away from WP Engine citing overloaded US/EU servers, slipping support, and typical hosting growing pains. Any update on performance in 2014?